Beer and Music. Is there a better combination? On one hand, all of us at Crumbs Beer are ready to pay extortionate amounts (plus booking fees) to see our favourite bands. Some of us even delight (or annoy, depending on who you ask) anybody with enough patience with our (somewhat dubious) musical skills. And on the other hand, we’re starting a brewery, so I guess our credentials as beer lovers are more than covered! Music and beer, a match made in heaven. In the case of the photo, quite literally! My intention was to write a blog post about the history of how the harmonious airwaves and the beverage came to be such great bedfellows, but it’s been done before, and quite well by the way, so I’m not going to risk any litigation for plagiarism and will just leave you a link: Beer Wrote This Song: A Brief History of a Match Made in Heaven. Instead, I’m going to take the opportunity now that I have your attention (hopefully) to talk about the great, local, not-for-profit organisation New Music Nights. They provide a much needed platform for original music in Reigate. Trust me on this, I have been to a few of their events and the talent is unbelievable! Ironically, the time my band played in one of their monthly events, it was only covers. Ooops. 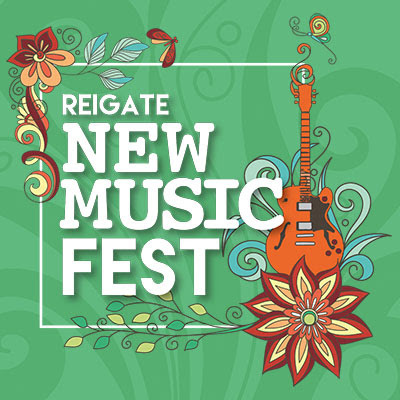 New Music Fest on the 17th and 18th of July in the Reigate Rugby Club. Come on, you know you want to! Click on the image! Anyway, I digress… The point I want to make is that we have been in talks with them and they’ve been kind enough to let us be their beer sponsor for the upcoming New Music Fest (even before they’ve had the chance to taste it!). The festival is on the 17th and 18th of June. So if you want the opportunity to listen to some of the best local talent while drinking some of our (hopefully) awesome Crumbs Amber Lager, the New Music Fest is your chance to do so (edit 11/06 – it IS awesome). And for being a current (or future) Crumbs drinker, you can get a 5% discount off the early bird tickets by using the code: NMFCB1.